March 27, 2015, Charlottetown – A pair of female skaters led the way for P.E.I. at a pair of recent national short-track events. Miriam Burnett had a trio of 7th place finishes to lead P.E.I.’s eight member team at the Canada East Short Track Championships in Fredericton, N.B., where 113 of the top eleven to fifteen year-old speed skaters from Ontario, Quebec, the Atlantic Provinces and Nunavut gathered to close the season. P.E.I.’s Jenna Larter closed her rookie season with a pair of top ten finishes at the recent Canada East Short Track Championships in Fredericton, N.B.. Photo courtesy of Fredericton Amateur Speed Skating Club. Meanwhile, Carly Connell placed 18th overall at the Canadian Junior Short Track Open Championships #2 in Toronto. Connell’s top finish in the four day competition came in the 1500 metre event, where she placed 13th in the 55 skater field. Connell’s teammate Jared Vriends finished 51st overall among the Junior men in Toronto, with top 40 finishes in both the 500m and 1000m distances, well above his original seed position. 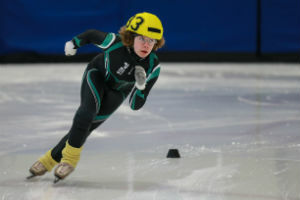 In Fredericton, Burnett was 8th overall in her 14 year-old girls category, finishing ahead of skaters from Ontario, New Brunswick and Nova Scotia in the overall standings. The Charlottetown skater also recorded a new personal best time in her 400m distance. Thomas McQuaid, Kyle Connell and Jenna Larter also nabbed top 10 finishes in at least one event each at the Canada East meet. McQuaid grabbed 9th in the 1500m event, and also earned a personal best time in the 400m distance. Connell had PBs in the 400m and also in the 1500m, where he took 10th spot, just behind his teammate McQuaid. Larter had large PBs in all three of her timed distances and placed 10th in the 200 sprint as well as in her 2000m points race. Peter McQuaid was the fastest Island skater in the competition, putting up a pair of PBs and taking 12th spot overall in the highly competitive 14 year-old boys division. Matt Kozma made strong debut in the event, notching three PBs and finishing 12th in his group. Eliana Monthony and Kristen Binns rounded out the Island contingent, finishing 13th and 14th, respectively, in the 13 year-old girls category. Binns had her best finish in the 400m event, where she was 12th. Monthony came up with her best in the 200m, where a new PB propelled her to 11th place. Island speed skaters take to the ice for a final time this Saturday at their season ending fun meet. The event goes from 9:30 to 1:30 at the Eastlink Centre in Charlottetown and is open to the public. For full meet results and information on Speed Skate PEI, visit www.speedskatepei.com.